26 March 2019–A new high-resolution map of a poorly known section of the northern San Andreas Fault reveals signs of the 1906 San Francisco earthquake, and may hold some clues as to how the fault could rupture in the future, according to a new study published in the Bulletin of the Seismological Society of America. Samuel Johnson of the U.S. Geological Survey and Jeffrey Beeson of Fugro USA Marine Inc. compiled the map for the 35-kilometer-long section of the fault between Tomales Point and Fort Ross, California. They discovered two large zones, each covering about two square miles, of slope failure on the seafloor offshore of the Russian River, marked by lobes that appear to have formed when the intense shaking of the 1906 earthquake caused sand liquefaction. Image of erosional chutes and depositional sediment lobes on the shelf offshore of the mouth of Russian River. | Johnson & Beeson, BSSA 2019. The mapping also demonstrates that there are two active strands of the fault within the northern part of Bodega Bay, each of which has moved tens of meters within the past 10,000 years. The findings “are not going to affect what we know about the recurrence interval or slip rate” on the Northern San Andreas Fault, “but it will affect what we know about how the northern San Andreas fault ruptures,” Johnson said. 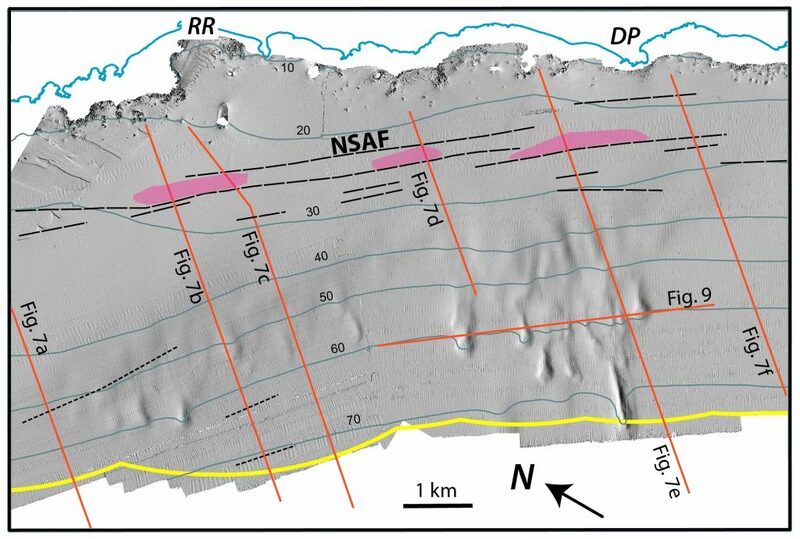 The researchers used data drawn from several techniques, including high-resolution seismic reflection profiles and multibeam bathymetry, both of which use multiple directed sound waves to image layers on or below the seafloor. Collection of some of the bathymetry data was funded by the California Ocean Protection Council as part of its work to designate and develop monitoring strategies for Marine Protected Areas, and by the National Oceanic and Atmospheric Administration (NOAA) to improve nautical charts. The liquefaction lobes, which are similar to the ground failure seen offshore of the Klamath River delta during the magnitude 7.2 Eureka earthquake in northern California in 1980, were one of the surprises uncovered during the mapping, said Johnson. Other insights from the map include a look at how movement along this portion of the fault has affected the onshore landscape, including the uplift of marine terraces and rapid formation of beaches and coastal sand dunes. For instance, the researchers noted that uplift west of the Northern San Andreas Fault has blocked the southward drift of sediment from the Russian River and Salmon Creek, leading to the swiftly growing South Salmon Creek Beach and its background of high coastal sand dunes.